One of the things I love about being here in UK is the hand pumped beers or cask ales as they are also called. These are unfiltered and unpasteurised beer that are not drawn from the kegs or containers by carbon dioxide but instead by hand pump or gravity. In UK you just have to look for the Cask Marque sign and you know the pub serves some good, traditional cask ale. If you go to the north of England you will get your pint like the one on the left, smooth and creamy. If you ask for a pint in the south you will get one like the one on the right, clean and crisp. The two pints shown are the same beer but poured in two different ways that produces slight differences in taste. There is more of an explanation here. Thursday Ann and I went to the February edition of London Bloggers Meetup. 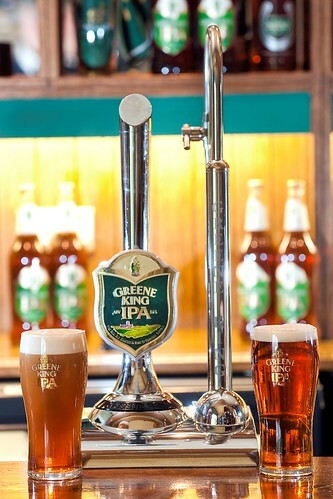 The meeting was sponsored by Greene King brewery who wanted to show of their new beer engine that could produce both Northern and Southern style pints. The head brewer John Bexon was there with another guy to tell about the beers and explained how to taste a beer. 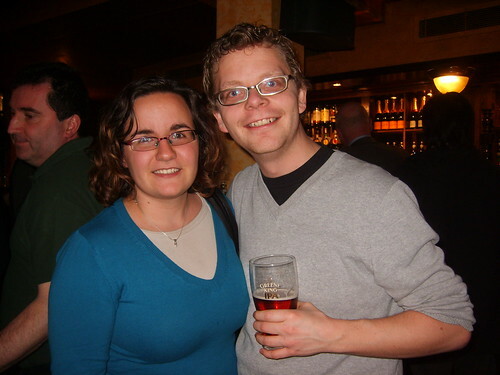 I enjoyed speaking to other bloggers and having a night out. The beer was very good I enjoyed both versions – and it was free which makes it even better. We had a great evening where we got away with goody bags filled with interesting beers from the brewery and tickets for a rugby game but more on that some other time. Yesterday the temperature snuck up around 17 degrees which was enough to drive most of the Prague population outside after work. 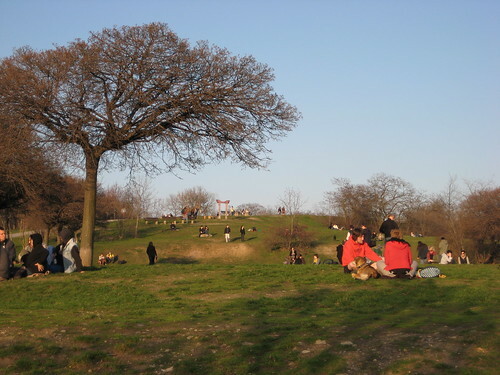 I went to my local beer garden on the hill of Parukarka (or is the hill called St. Cross, I’m confused?) 5 minutes from our place. There was a long line for the beer but eventually I got one just before they ran out of glasses. You buy the beer at either a small booth or inside a tiny pavilion pub and then you can take the the beer with you into the green field and hang around while watching the sun set over Prague. Here is a 360 shot taken outside the beer booth. Just before the sun set the pub ran out of beer. 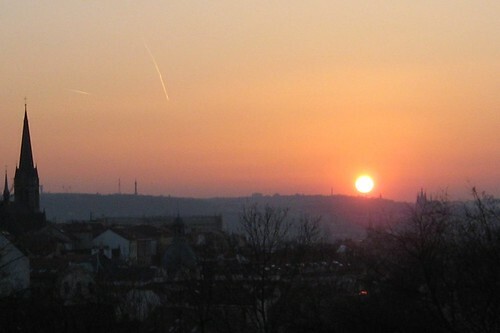 But that didn’t matter I still had my beer and went further up the hill to see the sun set behind the Strahov hill just to the left of the big castle on the other side of Prague. Did we just skip spring and went straight to summer?